Recreational swimming and diving is the third most common physical activity in the country after walking and camping with an estimated 360 million visits to recreational water venues per year. The sport of diving, both recreational and competitive, continues to increase in popularity (300+ clubs and 20,000+ members age 18 years and under registered with USA Diving). Such recent growth, along with the increasing complexity and difficulty of dives being performed in competition (the number of competitive dives officially recognized by the International Olympic Committee has jumped from 34 in 1920 to 227 today), has resulted in greater potential for diving-related injuries. It doesn't take an understanding of the laws of physics to know that once you are airborne, you can't completely control where you land. That is what makes diving into a pool (or a pond, or a lake) so thrilling for kids and, of course, so dangerous. Yet attention has mostly focused on catastrophic spinal cord injuries among older teenagers and young adults from recreational diving into water of an unknown depth or overuse injuries suffered by competitive divers from repetitive training. Up until now, we haven't had safety data to show just how risky diving (both recreational and competitive) is for younger kids engaged in recreational diving. Researchers at Ohio State University and the Center for Injury Research and Policy at the Nationwide Children's Hospital in Columbus, Ohio analyzed diving-related injury data for children and adolescents seen in hospital emergency rooms over the 17 year period from 1990 through 2006. Their findings, reported in the August 2008 issue of the journal Pediatrics , show that diving is much more dangerous than we realized, although not in the way we pictured. Collisions with diving boards accounted for nearly half (44%) of all injuries, even among 15- to 19-year olds, who were at increased risk of sustaining an underwater injury from contact with the bottom of the pool. 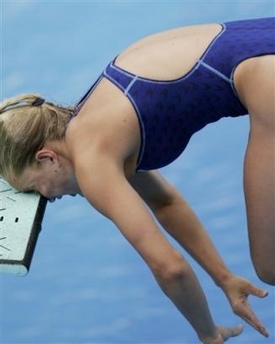 The odds of a collision with a diving board or platform were dramatically increased if the diver was attempting a flip, handstand, or backward dive. Diving from a height of more than 3 feet dramatically increased the odds of injury solely as a result of contact with the water. Safety data, such as contained in the study, is really a sport's report card for how we are doing with our training and educational programs on all levels, from the recreational to the most competitive. Retrospective data gives us a bird's eye view into where we are with a sport so we can draw some conclusions and facilitate changes in rules, teaching, safety, and equipment. The common myth about diving has always been that swimming pools are the safest place for kids to dive, especially if they are involved in a program and that diving or jumping into lakes, streams, rivers, oceans and unsupervised areas aren't as safe. The Ohio State report just goes to show that, when you look at the actual injury data for a sport, the myth may not match reality at all. When it comes to diving, swimming pools, home and community are not as safe as we all thought. So, where do we go from here? First, we have to recognize that change will not occur overnight. While clearly we need to improve the conditions of diving and decrease these injury numbers, it will take a bit of time and discussion among diving experts to figure out the best way to do that. Now that they have this data in hand, however, they will be able to modify their current programs and teaching styles in a way that is more developmentally appropriate and in a way that matches what kids are doing. Now that we know where the injuries are occurring and how they are occurring, we start there to intervene: the ages most at risk with the activities most at risk. Until then, we have to be very vigilant with the 10-14 year olds. I'm not surprised the injury rate is highest in this group. This group doesn't always know their limits. Their bodies are still growing so they tend to not be as coordinated as older kids. And, they tend to be a bit impulsive and try to mimic older kids. The more "teen-like" in age, the more impulsive they can be. Parents need to monitor what their kids are doing and I suggest talking to them about not engaging in the flips, handstand dives and backwards dives that put them at greatest risk of injury. If they are on a diving team and doing those dives under supervision, that is a different story. But, I would not recommend that kids under 14 attempt these risky dives without proper training. Diving coaches need to look closely into training and figure out if this group should even be attempting these dives. It may very well be they are not ready. Until that can be determined, I'd like to see public pools use this study to develop safety guidelines so kids are not allowed to do these dives. How about just a simple forward dive for all?? Okay to dive, but dive smart! So, this study doesn't say "don't dive". What this study tells us is we have to have our kids "dive smart." At the moment, we don't know what diving smart really is but we sure know what it isn't - this study made that loud and clear. I don't like to be an alarmist but sometimes we have to start with the alarm ringing and make a few changes before it completely silences. When child health is at risk, especially involving water and kids that are propelling themselves in the air, let's not tempt fate. Recreational and competitive diving are becoming increasingly popular. A new study warns that diving is actually more dangerous than once thought and in ways not previously appreciated.